In an incredible coincidence, the very day after I posted the article about the Christmas Eve power pole incident, La ENEE came out and replaced it. Was someone from the power company reading the Blogicito and said, "Hey, we need to get out there TOMORROW and do that repair!"? Nah. I predicted it would never be replaced. Is someone else in the neighborhood rich and powerful with those kinds of connections? That is probably the best guess. Anyway, it's done and it was done pretty quickly. They only turned our power off for a couple of hours. Notice how in my Honduranized thinking, I did not say, "Damn! 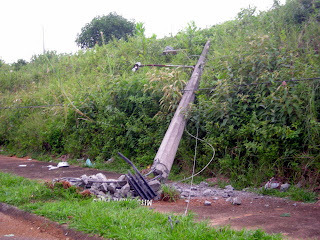 It took them three months to replace the damaged pole." I say instead, "It was done pretty quickly." referring to getting the new pole installed in a few hours. Life is more content with lowered expectations. By the way, I don't know why I call this a 'telephone pole'. We've been waiting for a telephone line to our house since we got on the list for telephone lines in February 2002, before we even built our house. Hardee-har-har. We apparently didn't pay the right person. Now I'm on my high horse and don't even want a landline from Hondutel. Right now there is a new scandal, supposedly involving Hondutel employees and 'black' traffic, in which poor innocent users are getting monthly phone bills for L.10-20,000 (US $529-1,058) and more in an attempt to cover up the illegal usage. What do you call those tall poles that hold the wires? I call them telephone poles regardless of exactly what kind of lines they carry. It may not make sense but I always have. This habit is causing a cultural divide in my house. Every time I say 'telephone pole', El Jefe frowns at me and says, "I don't know WHY you call that a TELEPHONE pole." 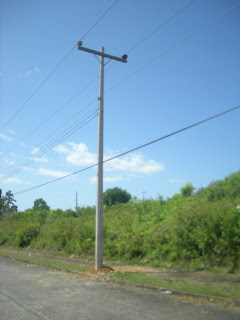 So, I have been trying to be more precise and refer to it as a 'power pole'. Thinking about it, it may be that telephone lines have been so rare in many parts of Honduras for so many years that it would be ridiculous to call them telephone poles. 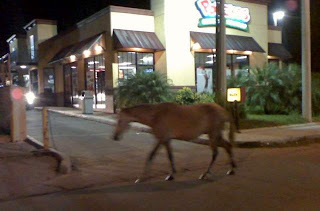 It wouldn't make any more sense than calling pedestrian walkways in New York City 'deer crossings'. Yeah. I get it now. Photographs of migration by Don Bartletti. See also the Between Two Worlds series of photos at the same link. How can your heart not go out to twelve-year-olds traveling alone thousands of miles to a country which they don't know to find their mothers? "Gift to a northbound traveler" made me cry. Thanks go to Teri in Costa Rica, YoYo in Paradise, for sending the link to me. Whoops, where did that telephone pole come from? I just ran across these photos and thought I would tell you about this. We were relaxing Christmas Eve afternoon, killing time before going to visit family and then to a neighbor's Christmas party (which was to start at 10 p.m.) when we heard a big BOOM! It sounded like a big truck had crashed into our muro (concrete fence). I grabbed the camera (for evidentiary purposes if needed) and ran outside, because I figured the culprits would take off rather than taking responsibility for the damage. 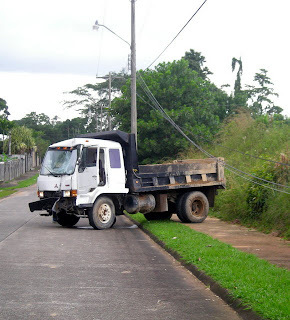 They said that the steering and/or brakes went out on the truck, so I guess we were lucky that they weren't pointed in the other direction and that there were no people or houses for that power pole to fall onto. This caused a big excitement in our neighborhood with several neighbors stopping by to chat (and laugh) about the situation. Not so funny was the fact that our internet and then our power and later the water went out. Christmas Eve! I had visions of not having electricity for days due to the holidays. Surprisingly, La ENEE came out the same day and temporarily rigged up the lines so we and our other two affected neighbors were powered back up after only a couple of hours. Good thing, as our neighbors were the ones having a Christmas party for 50 people! Not so surprisingly, La ENEE has never been back. 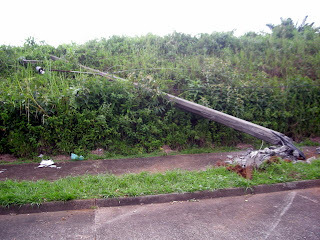 I don't know who is responsible to replace the power pole, but apparently it is no one. Someone must have called the police. Surprisingly, they came to our neighborhood. But also not surprisingly, they merely slowed down the car, gave the situation a bored look, and kept on driving. Not their problem. A few weeks ago, several guys came along and spent the day extracting all the mangled metal rods out of the pole for reuse or resale. The concrete itself disappeared. I have no idea who took it or why. Nothing goes to waste in Honduras. This guest blog was contributed as a rebuttal to Eduardo's guest blog yesterday, which was in response to my voluntourism article. The author has asked to remain anonymous. First: In these types of discussions we must distinguish between large scale, macro-level "development" projects involving governments and multilateral organizations and the smaller, grass-roots projects/missions of which LG originally spoke. The large scale infrastructure loans given by the IMF or World Bank are VERY different from the mission trips and NGO projects. A church group from the US is not giving a US$10 million loan to the Honduran Supreme Court! The large scale infrastructure loans rarely have a direct impact on poverty- they are the "trickle downs" of the development world. Second: I disagree with the establishment of a "Poverty Czar." Another American bureaucracy? Hmmm. I haven't worked on any of the large-scale loans/projects Eduardo refers to, but I can speak to human development funding given by USAID, UN agencies like UNICEF, and EU aid agencies, as I have worked on all at some point. I can tell you that USAID has a reputation for being the most strict in terms of compliance on project funds to NGOs. 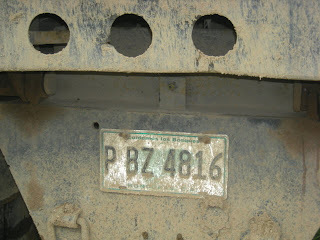 To give an example: the director of a local NGO I worked with was found to be stealing from a UNICEF-funded project. When I asked the accountant why the director stole from the UNICEF project and not the USAID funded project (channeled through my organization), she said, "Because he knew he would get caught if he stole from the USAID project." The US government does not need an additional compliance agency when the one it has is effective. I know it is effective because I have suffered through a US government audit or two in my career. But if the country has anything of value, then a China-like figure will come along and offer a loan with better rates and no strings attached. Angola is a perfect case in study. The World Bank put the pressure on oil-rich, corrupt Angola to provide transparent accounting of any future loan. The corrupt government was understandably very happy when China came and offered some loans for cheap oil, no strings attached! Angola refused the World Bank transparency conditions and took the Chinese loans. The poverty in Angola is NOT improving. Again, I'm not saying that multilateral donors are peachy-keen and great, just giving an example of the extreme situation Eduardo advocates. It is simply wrong that "the international lending and donor institutions have been feeding [corrupt systems] with NO demands for results or accountability." They may be flawed, but they do exist and they may have just prevented more damage from being done. I'm only speaking about large infrastructure project. The majority of communities receiving mission trips are already ignored by the government, so I doubt things would change if missions stopped coming. Fourth: I simply cannot support that "voluntourism" and "international donor" organizations have led to "increases in the poverty indexes." I assume that Eduardo is referring to the Human Development Index of the UNDP. I actually dislike using statistics to prove a point because 95% of all statistics are invented (wink wink). But since Eduardo claims that UNDP reports show that poverty indexes have increased, I decided to look at the UNDP Human Development Report for Honduras (2006). 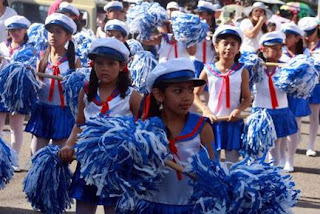 On page 6 of the 2006 report for Honduras, it shows that in spite of all the difficulties, overall human development has gone up in Central America since 1975. (On the UNDP scale a higher percentage means a higher percentage of development, not poverty. So in this case, it's GOOD to see increases.) IN NO WAY do I mean to imply that things are fine and progressing in Honduras. And I certainly do not support the macroeconomic reforms of the Washington Consensus. But OVERALL, Central American is better off than it was 40 years ago. To say that a mission group going to an impoverished community and giving some sort of service contributes to increasing poverty statistics is baffling. Have certain poverty indicators gone up over the year? Yes. But I'm not convinced by any means that "voluntourism" and community development projects are the reason why. Fifth: Eduardo says that "A host organization from Honduras (be it government, groups, individuals or local organization with international contacts) invites a group from the United States to Honduras to help the poor of a specific neighborhood, usually they themselves have done nothing to help these people and NO plans for sustainability are put in place before or after the visit." Really? EVERY single Honduran organization? I have seen irresponsible implementation like this, but it is not the norm. Yes, many organizations focus on one area − because that is what they know. If I want to help XYZ community, wouldn't I go to an organization that know that community inside and out? I don't deny there is some level of corruption in some projects. But from what I have seen on the ground, the level of corruption and mismanagement presented in the post is exaggerated. And I cannot agree more that those of us that are from countries like the US, Canada and EU member countries should take advantage of the fact that we have representatives that give a darn about what we think. If you don't like the way your government is funding overseas aid projects, then by all means, let it know. "I am a voting member of your district" carries a lot of weight! It is a luxury that those in the developing world don't have. And I cannot agree more that those of us that are from coutnries like the US, Canada and EU member countries should take advantage of the fact that we have representatives that give a darn about what we think. If you don't like the way your government is funding overseas aid projects, then by all means, let it know. "I am a voting member of your district" carries a lot of weight! It is a luxury that those in the developing world don't have. I don't know what the answer is. But I do know it doesn't lie in either extreme. Perhaps I am a hopeless optimist, I prefer to err on the side of too much help than none at all. The voluntourism original article, Why don't more people help the poor in their own countries? along with the numerous reader responses. The following guest blog was written in response to "Why don't more people help the poor in their own country?" LG, this is one your most important and insightful writings. I am a Honduran-born American Citizen and believe as you that “the juice many not be worth the squeeze” in many cases of voluntourism. I have worked with NGO’s (non-governmental organizations) throughout Central America and can tell you that many of the efforts to alleviate poverty in Honduras are not worth the costs associated with the effort. 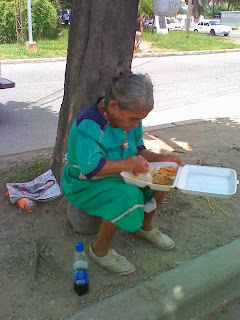 A host organization from Honduras (be it government, groups, individuals or local organization with international contacts) invites a group from the United States to Honduras to help the poor of a specific neighborhood, usually they themselves have done nothing to help these people and NO plans for sustainability are put in place before or after the visit. They usually want to use international aid to accomplish what should have been done with municipal and federal efforts and tax dollars. These people then reap rewarded monetarily and/or politically shortly thereafter. Back to the point, the cost associated with these trips, as is with certain fundraisers in the United States, is huge, lodging, alimentation, local and international travel, the time of each of the volunteers of work as well as other local expenses, all usually benefit those who are well heeled inside and outside of Honduras, not those whom these alleviation of poverty efforts are trying to impact. One of the major problems with trying to reduce poverty in countries such as Honduras is the corrupt system of the distribution of aid. Except for a few organizations, there is profit in theft and graft and very little risk of retribution for the illicit acts of corruption perpetrated against the poor. To look at the cost associated with the reduction of poverty in Honduras by Voluntourism and international donor and lending organizations from a macro perspective, the billions loaned and donated to Honduras over the last 10 to 15 years, not to mention the forgiveness of the debt along with equivalent millions in volunteer aid your writings make reference to have resulted in increases in the poverty indexes instead of the desired effects of lowering poverty; this fact is supported by the United Nations Development Program (UNDP) annual report which has been published every year since the loans and donations were initiated. 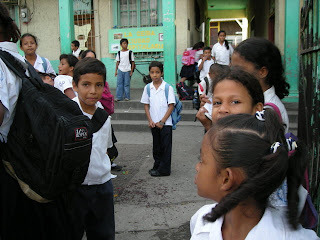 The only groups that are benefiting from all these donation and lending programs are the few very rich in the Honduras. As in the United States, the gap between the rich and the poor in Honduras is widening, the only difference is that in Honduras the widening is even more glaring and more negatively impactful. What do we do? The funds associated with all this travel abroad by these volunteer organizations to help the poor get out of their circumstances could and should be used locally to help the poor in their own neighborhoods, I’ll even suggest that you look for some unfortunate Hondurans, assist them in finding work, buying food for those who can’t feed their babies and performing random acts of kindness targeted towards an affinity group of your choice that may free up some cash for them to send to their needy families in Honduras. 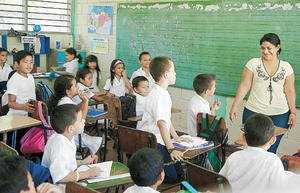 Since 9/11 the dollars sent by Hondurans to their dependent families in Honduras has flattened or decreased and the poverty in Honduras has increased according to every study performed by institutions such as the World Bank, the Inter-American Development Bank (IDB) and United Nations Development Program (UNDP). I wrote a letter to the US Embassy in Honduras, critical of a 10 million dollar donation to the Honduran Supreme Court for the purpose of restructuring the Court to be more transparent and resemble the US system. To me it resembled paying a system to hang itself with 10 million dollars. Why would a system (Judicial, Economic or Social) change itself when all is structured to serve them and the international lending and donor institutions have been feeding it with NO demands for results or accountability? 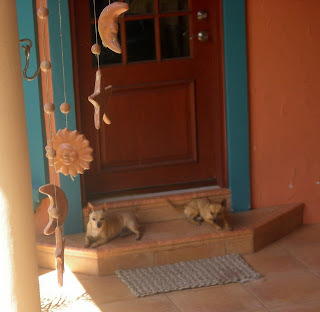 There is a saying I learned in Honduras “Don’t blame the dog for shi…ng on the rug, blame the one who is feeding it”. What I mean to say by this is that the system of corruption has been fed and kept vibrant by the international lending and donor organizations, they let themselves be fooled with dog and pony shows and few pictures of projects that usually are never completed or are of questionable quality by those like the World Bank which promote privatization of National services such as telephone (Hondutel) Water (SANAA), Electricity (ENEE). Privatization only benefit the rich and in the process hurt the poor by increasing rates for “improved” services when in reality the only thing they are improving is their opportunity to further sink into poverty. I am of the opinion that the US and other international lending and donor organizations should have adopted a “Marshall Plan” mentality after Hurricane Mitch as was done after WWII decimated the infrastructure of Germany, where a coordinated effort was made not only to rebuild but improve the all the infrastructure systems, which included manufacturing, roads and other infrastructure. Instead what actually happened, like with Hurricane Katrina (USA) and Mitch (Honduras) billions were raised and donated and no one knows where these funds are or what their impact was. It is not too late to get something like the above mentioned accomplished. To continue doing the same thing, the same way, we are guaranteeing the same results of graft, corruption and the continuation of increasing poverty. I believe in “tough love.” The USA should lead the international donor and lending organizations in cutting off ALL donations and low interest loans to Honduras and other countries with the same levels of graft and corruption (with few program exceptions). Some would argue, what about the poor people? My response would be, do not worry about the poor, they were NOT getting the funds (or equivalency) that was due to them anyway and in reality the poor would not be adversely impacted. (You don’t miss what you never had.) Go and ask any member of the Garífuna communities in the Atlantic Coast, ask any member the San Judas, one of the marginal communities of La Ceiba, Honduras. An international commission along with a Poverty alleviation Czar (with teeth) should be named by the next President to effectively and transparently manage the international loans and grants destined for projects and programs in Honduras. Additionally, the commission would oversee the contracts and quality assurance along with the application of penalties for non-compliance of contract terms. 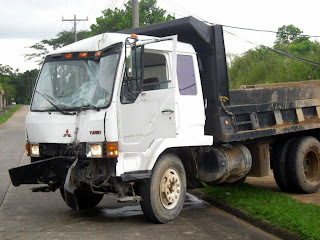 This last part of the duties of the commission, “oversee the contracts and quality assurance along with the application of penalties for non-compliance of contract terms” has been a glaringly missing the point in the contracting efforts for the reconstruction of the Honduran roads and infrastructure. If they do not finish or the work is sub-standard quality, so be it and no recovery of funds or punishment are levied against the offending company. 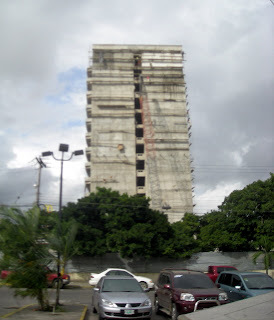 I am qualified to comment on this issue from a technical and operational perspective because, “I’ve been there, done that” and I earned a degree in Urban Planning and Environmental Design along with having worked all over Latin America in the areas of Human Development and the formulation of Sustainable Development Plans for African descendant communities in the region of central America. I think Honduras is a beautiful country, its people, although sheep-like, are essentially wonderful. The leaders on the other hand, leave much to be desired. 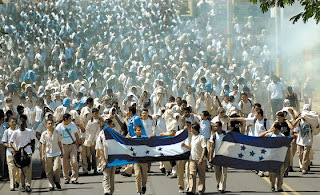 The children of the leaders of Honduras grow up with the same mentality of rights of ownership and the thought that they are above the law along with a serious lack of empathy and consciousness equal or greater to that of leader parents. I think the Tough Love methodology of fighting poverty is the best remedy for this problem graft, corruption and lawlessness as it relates to Honduras. I have high hopes for the country. People like you who are reading LG Blogicito can make a difference by writing to your congresspersons, voting, keeping abreast of policy and legislation which effect a region of your interest and taking part in the upcoming 2010 Census. The original article, Why don't more people help the poor in their own country? along with the numerous reader responses. Why don't more people help the poor in their own country? 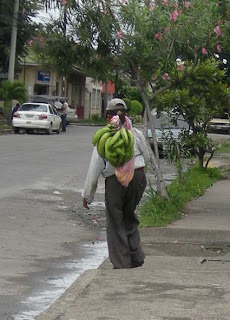 I'm a little bewildered by the vast numbers of people who come to Honduras on missions to help the poor. Oh, don't get me wrong: I know there is great need and I believe 100% that their hearts are in the right place, I'm just not so sure that the end result is always worth the cost. Sometimes there are concrete results: a child is cured, a bridge is built, a family gets a home, a community gets a clean water system, a clinic, a school (for a time anyway − many of these projects fail over time, too). The volunteers often get written up in the local newspapers and invariably the comment is made, "This trip changed my life". 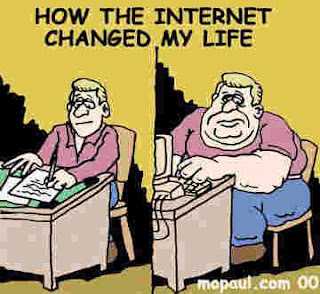 If only it were so easy to change someone else's life. Many 'voluntourists' come for two weeks. They often don't have any particularly relevant talents except a desire to do something. In some cases they want to teach the poor something that they themselves don't know. 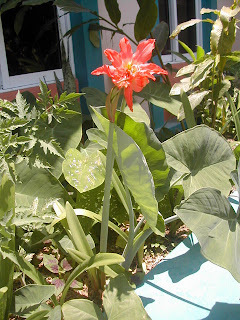 Just as an example, I've gotten so many emails from people who say they are coming down next week and want me to teach them about tropical gardening (in a quick email!) 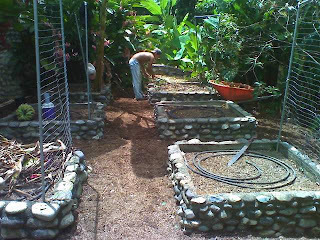 so they can teach the poor how to grow vegetables so they will be healthier or more self sufficient. Well, guess what? The poor who aren't growing vegetables don't want to grow vegetables. They don't eat them, don't want to eat them, and may even consider growing vegetables beneath them or beyond their capabilities. There is nothing that you can do that will change their minds. Just because you say that eating vegetables is good for them isn't going to change the culture. 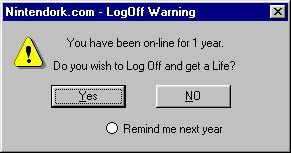 If you go back next year or the year after, I'd like to know if they are still growing vegetables! 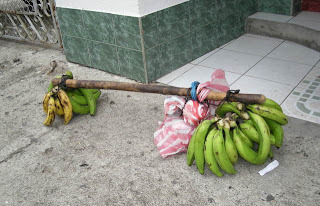 Many of the poor do grow bananas or plantains (which are staples of the diet) if they have space and want to − surely gringos aren't going to come and teach Hondurans how to grow bananas? So many people think that if only the poor people know about x, y, or z, it will change their lives. All they need is for a gringo to come and enlighten them. If only it worked that way! You are probably going to meet two kinds of people. One is the kind who will smile and thank you while they are thinking to themselves "this gringo doesn't know a thing about my country or culture." The other is the kind (usually the people with a little more power and influence) who will have a reason why every suggestion just won't work in Honduras and can't even be tried. I don't want to hurt anyone's feelings and I'm not saying that people shouldn't volunteer to help in Honduras. I just think that the longer term volunteers working in their area of expertise who also have a better understanding of the culture and the language have a much better chance of actually making a difference. "Voluntourism" isn't a bad thing, it's just not necessarily the best way to solve the problems of poverty. I strongly suggest that anyone considering volunteering in Honduras read Joann Van Eggen's article, "The cost of short-term missions". ABC's 20-20 had a special on the poor of the Appalachian mountains last week (which I didn't see) and a follow up this week which talked about some of the effects of the help that had been received (a toothless 30-year-old woman who was getting new teeth, a poor family who was given a house, a medical clinic which received donations, a high school boy received a college scholarship, and so forth). 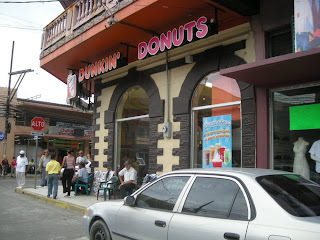 It got me wondering why more of the people who come to Honduras don't instead go help the poor in their own countries, where they do know the culture and the language, already know what can help someone to succeed in American society, and more importantly, where the people needing help are more likely to respect their opinions. Why are their own countrymen somehow less deserving? Be sure to read the insightful comments by blogicito readers below, as well as the related guest blogger article and the rebuttal to the guest blogger. I was so impressed with the long antennas on this beetle. The beetle body was about 2 1/2 inches (6.4 cm.) 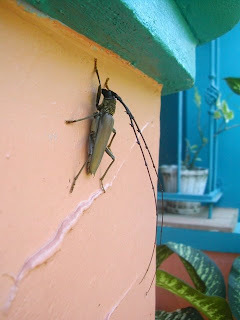 long and the antennas were about 6" (15.2 cm.). This photo was taken a long time ago. A worker who happened to be here at the time wanted to kill it but I said no. Later on I looked up this beetle and discovered that maybe I should have let him kill it. It seems that this bug chops down trees, believe it or not! Hacienda Guáquíra has more information about this beetle, in Spanish, but with several photos, including an example of a large branch downed by the bug. We have had several trees fall down behind our property. It is pretty stunning to hear that loud "craaa-ack!!" and then the slow crash to the ground of a 30-40 foot tree. 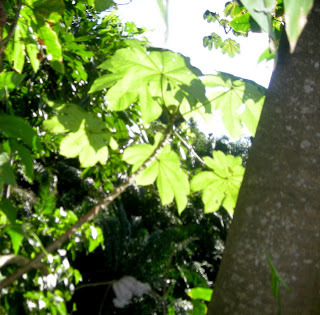 Many of the trees around us are guarumo (cecropia), a tropical type, very tall and slender with few branches. So tall and close together, in fact, that they sometimes take other trees down with them when they fall. Thankfully there are none of this type close enough to fall on our house! 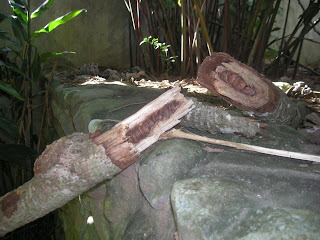 I couldn't get a good photo of the guarumo tree but Mary in Panama (A neotropical savannah) has some good photos and discussions of the guarumo tree on her blog in My crecropia and Decapitated cecropia. You might think that a falling tree is a rare occurrence. Not where we live. I've heard two fall last week. 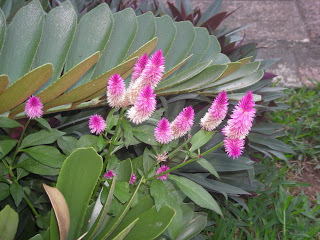 Every rainy season, we hear several fall behind our property in the jungle area. I don't often go down to investigate anymore because I've gotten a little more afraid of what snakes might be down there. This is a good example of how knowledge changes your attitude. These are photos of both ends of a large branch which fell a few days ago, when there were no winds or rains as a likely cause. You can see in the photo below that the other end is still alive and healthy looking so I think that this may be that beetle damage. A couple of years ago when two trees on our property fell and we had a closer look, I thought it may have been the result of an ant infestation. A certain kind of tropical ant does cause destruction like this. The loss of a 30-40 foot tree is a sad thing, but it is amazing how quickly they are replaced by another tree in this tropical environment. 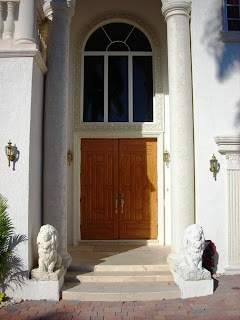 Just to hopefully keep me out of trouble for using the photo, the 6 bedroom, 6 1/2 bath Ft. Lauderdale, Florida, house in the top photo is for sale and can be yours for a paltry $2.9 million. And, just to bring this back to cultural differences, I've been in Honduras long enough that it was amazing to me to see a $2.9 million dollar house with no bars on the windows, no armed guards out front, and the property and pool completely open to the waterfront. Honduran readers, in your wildest dreams, can you imagine that? The Blogicito seems to be developing quite a Honduran expatriate reader base. I like that! I seem to be getting more and more Honduran readers who tell me that they told their brother in Houston or sister in New York about the Blogicito and he/she loves it. Who woulda thunk it? I'm glad to have you! I've also received tons of email from American women whose lives are being turned upside down by immigration situations of their significant other. Real heartbreaking stories. The same goes for Hondurans who have been deported, some who were brought to the US as babies or small children and are now being sent back not knowing the culture, not knowing their family here, and sometimes not even knowing the language very well. It's easy to have a black and white opinion on immigration in the abstract. It's a lot harder when you know the human beings involved. I know that immigration is a hot issue right now, but how can anyone not feel empathy? For anyone who doesn't, imagine this: You've grown up in the US and are now a 20-something and all of a sudden one day, immigration picks you up and says you are going back to, oh, let's say, China! You don't know anyone there, you don't speak the language, if you have relatives, you don't know who they are and they don't know you. You are dumped off the airplane in Beijing and expected to figure out how to make it on your own. Oh, then add in the fact that your wife and children now have the choice of moving to China, probably to a life of poverty, or never seeing you again. 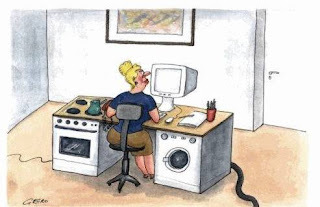 My husband J sent you an email this week and was so delighted that you wrote him back. I'm sure the blog keeps you busy enough, but I felt compelled to send you a quick note to tell you how much your thoughtful response meant to him and how much your blog has meant to us. I've looked to your blog for insight since the early days when I was traveling to Honduras alone and have always really appreciated your observations and takes on the issues facing Honduras today. I introduced J to your blog some months ago to give him something to read in English on a subject dear to his heart, but I really think that it's been much more than that for him. As American culture is still often bewildering for him, I think that exposure to American sensibilities in the context of 'normal' situations has really helped him appreciate our values and paradigms much more than my feeble attempts to explain the "honor system" (ha ha) ever could, and that reading your blog has been instrumental to his adjustment to life here. Wow. That made my day. What a tremendous compliment! It's kind of amazing to hear that the Blogicito has a part in someone else's life. I wish the best of luck to both of you in getting that US residency. Write any time to let me know how it's going. By the way, for any of you wives or husbands who are moving to Honduras with your spouses (deported or not), consider joining our Honduras Living discussion group. You'll find a lot of support and good, honest answers to the million questions you might have. 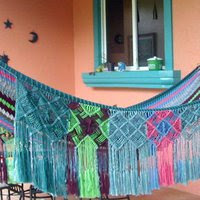 This is the best place to get information about living in Honduras! When students are made to memorize facts without understanding the context. When students have no books but only the knowledge of the teacher, or lack thereof, to learn from. When teachers cannot admit a mistake and will, in fact, fail the student who dares to question anything the teacher has said. When students never learn critical thinking but instead are taught from an early age to not think, only to memorize and obey. When teachers and parents have had such a lousy education that they can't recognize that their children are getting one, too. When teachers fail 50%, 75% or 98% of their class. The only thing that proves is that the teacher is a failure. When students can't understand the concept that there may not be a "right" answer to every question. When students never learn to think for themselves, but rather are threatened with failure by the teacher if they do. When teachers can not admit that they don't know something. When being literate means that you can sign your name, read numbers up to 10 and read a sign, but not comprehend a paragraph. When a high school student thinks there are 60 seconds in an hour and can't be convinced otherwise. When an entire high school class cannot answer this problem because they have never seen it on the blackboard: "A rancher has dug 40 holes to build a fence around a 1,500 square meter pasture. How many fence posts does he need?" "Not fair" they shout! "You never gave us that problem before!" When students can graduate from high school and even university without ever in their life having read an entire book. When politics, parades, snacks, and statistics are more important than providing the real thing. Oh, if only I could write like that. 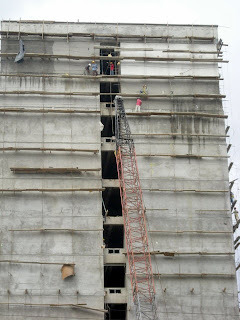 Construction workers in Honduras are expected to take incredible risks. There is no OSHA here to protect workers from hazardous materials or work conditions. If one worker won't do something, another one will. 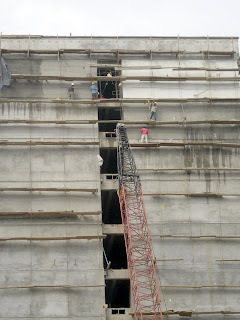 You can click these photos to see the workers closer. I was queasy just taking the photos. This building is about 12 stories tall. The workers are walking around on stacked up boards (probably 2" x 12") with no safety lines, no nothing. A lot of good those hard hats will do if the worker falls 10 stories! It does appear that there is some sort of flimsy wire about waist level. That may be the constructor's flimsy attempt at workplace safety or it may serve some other purpose entirely. 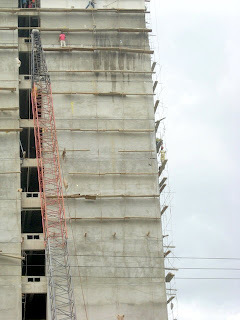 The workers are doing the concrete finishing work which involves throwing a coat of rough concrete (repello) against the concrete blocks and then putting on a layer of thin concrete (like stucco) and finishing it smoothly by hand (pulir). The throwing action is what makes concrete stick to the rough blocks. That work requires a lot of body action. Hey, I've walked around on boards like that during our home construction! It is SCARY! The boards sag with each step and when someone takes a step on the other end, the boards bounce like a trampoline! And I was only two stories up, or maybe the equivalent of three if you count the time we had to go up and measure the square footage of the roof. Actually, I'll tell the truth. I was so scared on the roof, that I crawled, not walked around. I was more worried about falling off than preserving my pride. We were shocked when a worker was electrocuted to death at another of our constructor's projects. We were even more shocked when one of workers whispered to us that someone died at every one of our constructor's projects! I hope he was exaggerating. By the way, the owner, not the constructor, is the one who is responsible for burial expenses and compensation to the family. It may or may not be law, but it is custom. Thankfully, there were no deaths during our construction, though I did do my share of doctoring booboos and we paid for medical expenses a couple of times. To expand on the previous article about frustrating shopping experiences, I thought I would provide some real life shopping conversations that seem to have been burned into my brain. 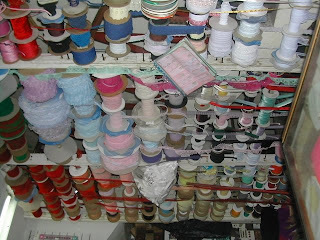 Here is an experience in a sewing supply store which illustrates the "20 questions" style of finding what you need. I need a zipper for a cushion cover, so I ask "Do you have a 36" black zipper?" Do you have a 36" zipper in any color? Do you have a 32" black zipper? Do you have a 28"? Me, heartbroken, but thinking maybe I could sew in two zippers, to open at the middle. "Well, what is the longest black zipper that you have?" "........Uh, okay, I'll take it." Can you help me find crema dulce (sweet cream)? No. We don't sell it. Oh, wait. There it is, 60 cartons of it, right behind you. Do you have white bathroom caulk? Oh, look! I see it now, just right there to your left. Oh, how wonderful. Here is the exact one I need on the counter. Do you have these blue flip-flops in size 7? No, but look at these pink high heels in size 5. When are you going to get some more Tums? Explanation that they are antacid pills. No, we don't sell any medicines here. But I've bought them here before. But I know that I've bought them here. Are you not going to sell them anymore? No. We've never sold sell medicine. Manager, who overheard the conversation: We should get more Tums next week. I'm finished shopping, here are all my purchases. I'm ready to pay. "You can't. You have to wait until the cashier comes back.... Uhhh, maybe an hour." "You can't. The system is down." "You can't pay until the manager comes back. ....Uhhh, I don't know. You could come back tomorrow." Thank you for your purchase, but guess what? Oh, you know those items that you just ordered and paid thousands for? Well, fíjese que*, it turns out that we don't have them after all. You'll have to buy something else because we don't give refunds. * Fíjese que is an expression that means something like "note that ....", or "pay attention that ...." In English, we might say, "Look, ...." or "The truth is that ....". Some people start virtually every sentence with it for some unknown reason, kind of like the English speakers who pepper everything they say with "you know." I have never been a shopper. I used to make lists and put it off as long as I could and then would hit 12 stores in one day to get it over with. 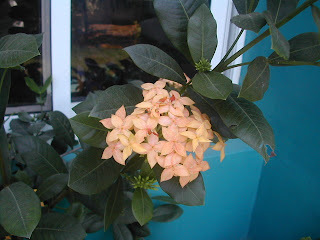 It's just not something that I particularly enjoyed and even less so now in La Ceiba, Honduras. It is just so hard to spend money in La Ceiba. Oh, not everywhere, sure. 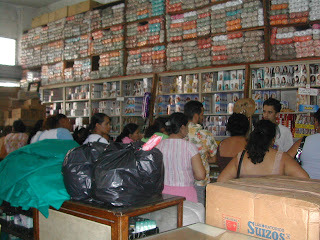 Some stores are nice, well-enough stocked (by Central American standards), and the employees are helpful. But those are the exceptions, not the rule. More often, you just can't find what you are looking for. If the store is stocked with items to sell, no one knows the price or it's not in the system (if they have a system) so they can't/won't sell it to you. This is not a rare occurrence. It happens All. The. Time. It even happened to me once trying to buy a friggin' candy bar at a gas station. I hadn't had a candy bar in ages, and I was really craving that Almond Joy bar. No one was authorized to 'guess' whether that candy bar cost the same as all the other same-size, same-brand candy bars. So no sale. Tough luck. The same thing has happened a number of times with very expensive things like furniture as well. You leave your phone number, they promise to call, you take your pile of cash back home with you, and wait for them to call with a price. Futile. It will never happen. Would you believe that we once were ready to spend more than L.100,000 but the business apparently didn't want to waste L.20 to call us back? That is the impression we got anyway. 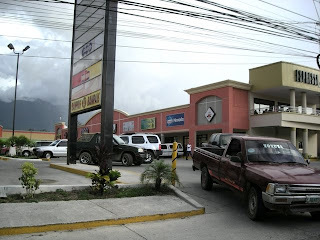 The Honduran Yahoo groups that I read receive numerous requests for information about various hotels, car rentals, shipping companies, and other businesses. "Have they gone out of business?" "Does anyone have a current phone number or email?" "Why don't they answer my email?" "Is their phone disconnected?" "They don't return my calls!" Yes, it is true that we have our share of electrical/internet/phone disturbances, but when a person says that they have been trying to get in contact for a month, that excuse just doesn't cut it. Do they just not want the business? It kind of seems that way sometimes. 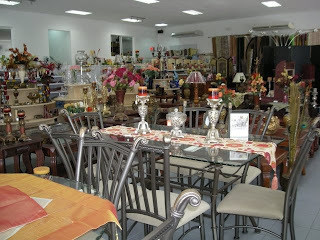 Some businessmen might think that it is a good idea to stock the store with hot-sellers that everyone wants. But what a drag that is! More work, you gotta order more, then you have more work selling the items. Better to just keep the old dusty things on the shelf that no one wants. And then raise the prices on those old things because you aren't making enough profit. One hardware store is stocked with a zillion kinds of locks, but has one style that sells like hot cakes. A whole case! Just like that! "When are you going to get more of those?" "We're not. We sold them all." More than once, I've seen just the thing that I was looking for locked up with all the 'expensive' things in a display case. "I'll take that one, please." "You can't. I don't have the key." 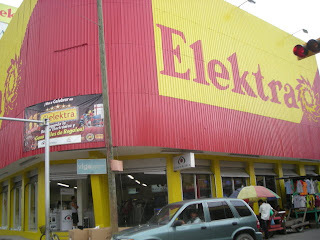 Experience with an electrical store with a branch in La Ceiba and the main store in San Pedro Sula: The style of outlets and switches we want to buy for our home construction are sold in the San Pedro store but not the La Ceiba store. We ask if they could order them for us from San Pedro (2 1/2 hours away). Naturally we'll pay in advance and be completely at your mercy as to when or whether you will actually ever order them or not. We'll gladly pay the shipping cost − even though they will arrive on the store's truck with the weekly stock from San Pedro so it doesn't really cost any more − but that's okay, because that is the politica (policy). This was a high dollar order (around L.25,000 lempiras, as I recall). "Nope. 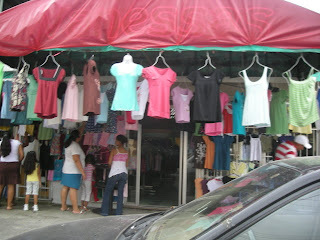 We don't sell that style here in La Ceiba." Experience with a tile store, same situation, one in La Ceiba, bigger one in San Pedro: Both stores carry the same exact ceramic tile that we want, but the price is 30% higher in La Ceiba. We ask if they (La Ceiba) can do better on the price. No. We point out that we can go to San Pedro and buy the same tile cheaper, including paying for the gas to get there. No. We point out that they'll lose the profit if we buy it in San Pedro. No. That's the politica. So we order the tile by phone from San Pedro, transfer the money (about L.15,000) to San Pedro pay for it, and pick up the tile the next week at the La Ceiba store. We still saved about 25%, even though we had to pay for shipping. Not only that, but the La Ceiba store employees had to unload our items from the delivery truck and load up our car for free. Does it make good business sense? I think not. Standard practice when working up restaurant menus is to put every wonderful thing that you've ever eaten on the menu. Also put on the menu all the desserts that you would sell, that is if you were planning on serving desserts, which you aren't. Then buy chuletas, chicken, and bananas and tell everyone "no hay" (there aren't any) when they ask for anything else. Okay, on the other hand, recently I've seen improvements in service and availability. Lately I've been shopping at a store where one of the clerks treats me like I'm her most valued customer even though I spent a total of maybe $10 there. She remembers my name. She never tires of pulling things out for me to look at. If El Jefe goes, she asks where I am. If I go, she asks where El Jefe is. I ENJOY going to that store! 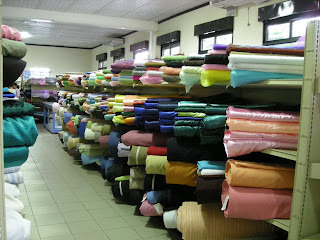 In fact, good, friendly service has paid off − I recently spent thousands there on curtain fabric. There are a few places − and not coincidentally they are usually owned by non-Ceibeños or are branches of larger San Pedro stores − where the service is everything that you could want or expect in the US and maybe more. Thank God! These places are restoring my faith. I used to just dread shopping anywhere. I'm hoping that these newer stores will put some pressure on the old-timers to change some of their practices or at least train their employees a little better. Honestly, I'm not the only gringa who has wondered, "Why doesn't anyone want to take my money? I'm ready to buy!" Plastic surgeon, Dr. Robert Rey, star of the television show Dr. 90210, participated in the operations on three children with cleft palates yesterday in the capital city of Tegucigalpa, Honduras. He said, "Thanks to the surgeries that I perform [on wealthy people in the U.S.], I can help the poor. I feel like a modern Robin Hood. There is much need here. This motivates me to return." This was Dr. Rey's first trip to Honduras, and today (Saturday) he will be traveling to the Honduran island of Roatán before returning to Los Angeles, California. Proceso Digital stated that he will also be visiting La Ceiba, where he will give some economic help to a young Honduran who lost both hands after falling from a train in an attempt to enter the U.S. illegally. The reality series Dr. 90210 is shown subtitled on cable here in Honduras. 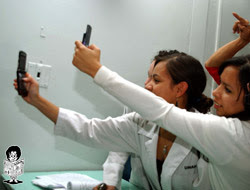 His presence at the Hospital Escuela in Tegucigalpa caused havoc among hundreds of the media, female doctors, and medical students trying to see him and take photos. "The cries and the sighs of crazed followers broke the quietness of the operating rooms," reported La Prensa. The melee actually delayed the surgeries for several hours. Dr. Rey, 43, was born to a very poor family in Brazil and was adopted by a US family. He said that he hopes to return to Honduras this year although it is difficult because the demand in this country is high, but no more than in other countries. He highly complemented the plastic surgeons with whom he worked. El Heraldo quoted him as saying, "In addition I will buy a house in Honduras to come regularly because I am fascinated with this country." Hmmm! US doctors, dentists, and nurses frequently come to Honduras on medical missions, often to the poor areas where there are no doctors or hospitals. Just about any week of the year, there is a US medical mission somewhere in Honduras trying to meet the needs of the people who are forgotten by their government. Operation Smile (Operación Sonrisa) is an organization that specializes in treating poor children with cleft palate and regularly comes to Honduras. Unfortunately, not being television stars, these volunteers don't get quite as much attention. Thanks for the laugh, D! Hondurans, in general, are very accepting people and tend not to want to bring any "bad news" to light. Pride has something to do with it, I guess believing that if something isn't talked about, there is no need to be embarrassed or shamed. Children are taught in school to be proud of their country, as they should be, but blind pride or a fatal acceptance of the way things are only serves to perpetuate the problems. US Americans, in general, are just the opposite, demanding much of their governments and believing that if only the truth is brought to light, something will be done to 'right' a 'wrong' situation. One example is from the early 1900's when the exposés by yellow journalism of child labor and the abuse of poor working men, women, and children in sweatshops shamed the politicians into changing laws. I have to admit that my complaints were the original impetus for getting a law changed in Texas several years ago! Sure, I got the brush-off several times but we didn't quit and ultimately, the state law makers agreed that we were right and the law was wrong. There are thousands more examples of complaints resulting in changed laws or justice coming to a bad situation. It's not that our politicians are better − it's just that it isn't as easy for them to get away with corruption because we COMPLAIN! Our complaining doesn't always get results but we keep on trying and sometimes succeed. 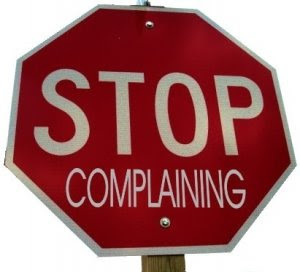 Complaining can be healthy. US Americans do a lot of complaining. It's a fact and a part of the culture. After all, weren't the complaints of "No taxation without representation!" the impetus for starting our country? Not all complaining is good or high-minded and not all complaining is bad. Feeling somewhat removed from the US now, I have to laugh at some of the things that I hear Americans complaining about. A healthy median, if that can be found, is a good thing. Hondurans have a lot of legitimate reasons for complaining but they seem less likely to share their complaints with outsiders. Some of my favorite Honduran people sometimes wince at the things that I write about. One person even said "How embarrassing for us." in regard to an article. Just as I hope that I am not judged by the things that my government or greedy US businessmen do, I don't judge Hondurans by the things that their government or corrupt businesses do. 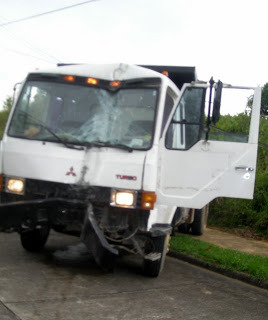 I say that there is no reason for the average Honduran citizen to feel personally embarrassed. Despite the fact that Honduras claims to be a democracy, the average citizen has no control over what their government does or does not do, but maybe, just maybe, if enough citizens complain about the injustices, some things will change someday. The typical means of getting complaints noticed in Honduras is to "take the streets" with a protest march or by simply blocking the street with vehicles and humans. Since many towns only have access by one road, the inconvenience and economic damage caused by taking the street can be great. In La Ceiba, for example, protesters can virtually block off access to the entire eastern part of the country by blocking the highway. Protesting is a right guaranteed by the Honduran constitution and only rarely will officials intervene. The larger the number of protesters, the more attention it gets from the government, though as often as not, it sadly only results in false promises from the people in power. Protests are sometimes misused for political reasons, with paid attendance, but overall, I think it is a good thing. People need to be heard and unfortunately, it sometimes takes extreme measures to be heard in Honduras. Refusing to admit or pretending 'it' doesn't exist only perpetuates the evil. 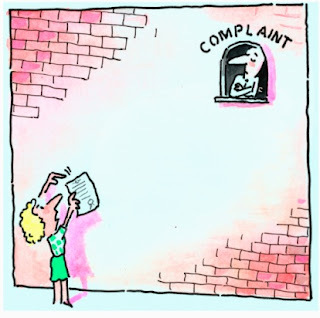 Tip for expatriates: Just as women who complain about their husbands (or vice versa) don't necessarily want to hear you complaining about their spouse, most people don't want to hear complaints about their own country. ;-) Even if they are the one who brings up the subject, complaints from a foreigner may not be so well accepted. Blogging is my major stress reliever when I just have to get something out of my system. Super Bowl, what Super Bowl?